Welcome to the penultimate blocks in the Farmer's Wife 1930s QAL. 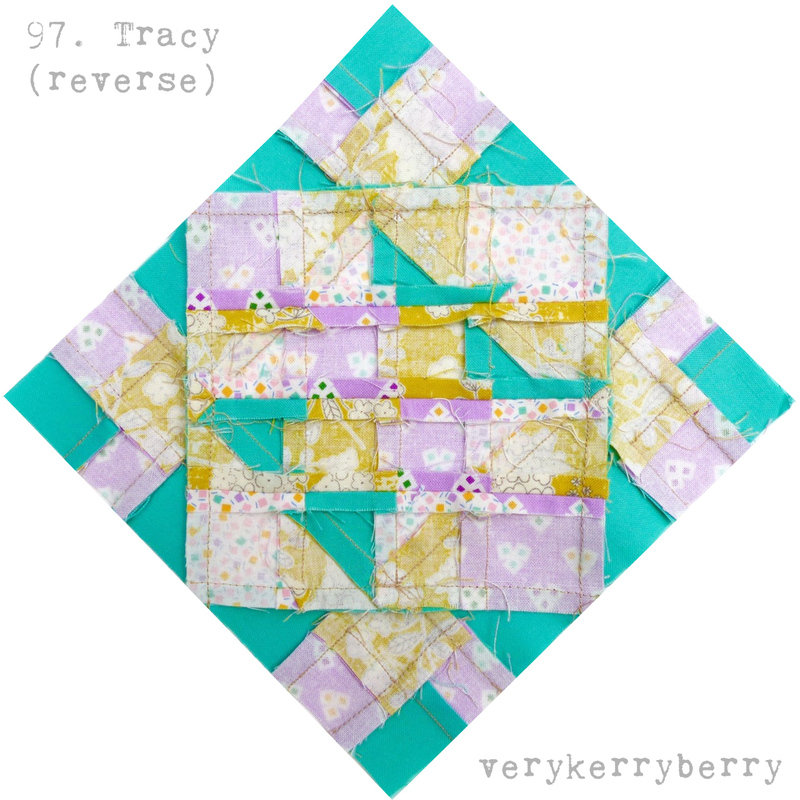 This week, we are making blocks 97 and 98 and the first is Tracy (p.256, letter p.68). I thought I'd share a little about how I choose fabrics for blocks. For this one I followed the suggestions in the book photo and used four different fabrics. I thought one solid would be sufficient: it gives some definition and contrast to the prints and more than one can have an overly strong effect and dominate the ditsy prints so I didn't add another. The medium floral has a scattered spaced out print and a textured background and this contrasted with both the other geometric prints. The v.small geometric provides lightness without the starker/flatter effect of a solid and the small all-over geometric is a middle point between the two prints in terms of scale and the pattern is directional. These are for foundation piecing so are cut larger than needed. 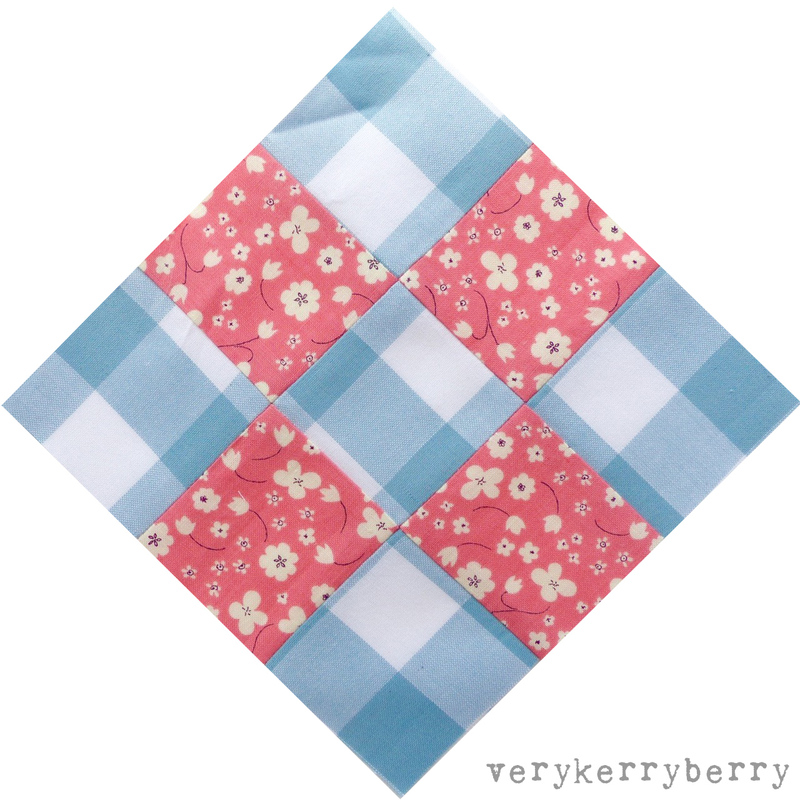 The centre section of this block should nest together when you join the seams - I must've been day dreaming when I was piecing because mine didn't! For this block, some of the large half square triangles are added as oversized triangles and trimmed back using the quilt ruler's 45 degree line. 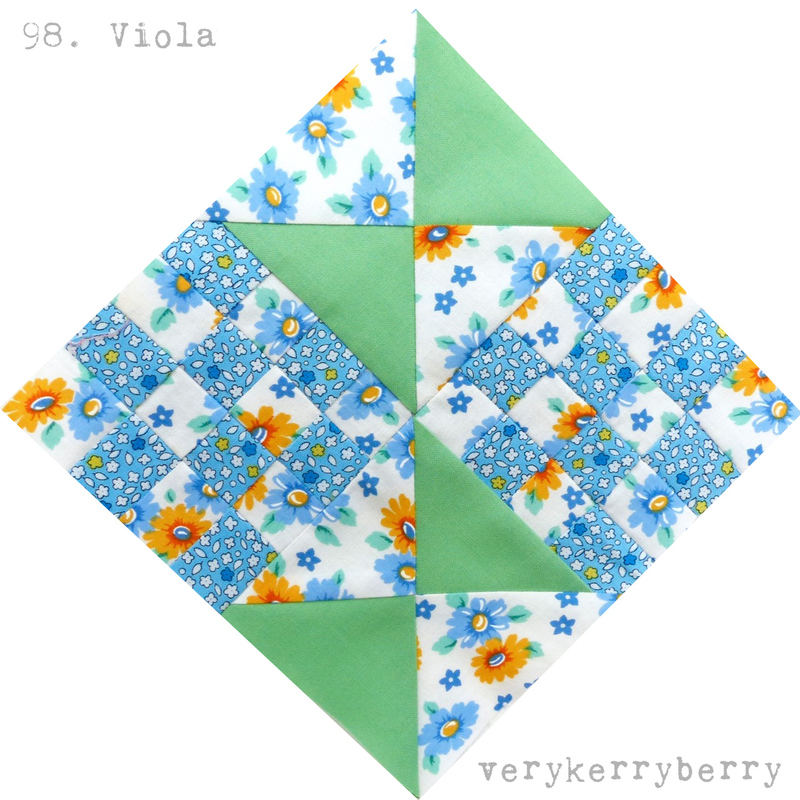 Viola is a straightforward block and quick to foundation piece. Jo from A Life in Lists is guest posting on this one- she'll get the post up later today then you can pop over and read her thoughts on it. Don't forget to share your blocks or leave me a link in the comments so I can see where you are. I know the QAL is coming to an end but you may be working on a block from earlier on and I'd love to see. I'll be back with the last block next week. A huge thank you to all my guest bloggers who did an amazing job sharing their skills, tips and knowledge, their successes and failures and their beautiful blocks. You can find all the posts here. August at Eternal Maker: Sale weekend! My timing is just right again for a visit to sponsor Eternal Maker, it's sale weekend. All prices reduced by 16% with the code SUMMER16 through till the end of Monday 29th August. Bows on navy Pin cord by Cosmo Tex. Fine corduroy, ideal for Rosari skirt! Pauline Alice, Rosari Skirt Pattern. Adaptable pattern with 1970s style and lots of length and pocket options. Allotments in navy, Karen Lewis for Robert Kaufman, beautiful quilting cotton. Summer Forest from Nature Trail by Bethan Janine for Dashwood Studio. Quilting Cotton. Leaves from Nature Trail by Bethan Janine for Dashwood Studio. Quilting cotton. Tutty Fruity natural by Alexander Henry, heavier weight cotton- good for bags, cushions, making storage sacks. Princess Castles organic jersey cotton with 5% elastane by Lillestoff. Ideal for the Iris Tee. Iris Tee- Multi size tunic 6-12months to 9 years, PDF pattern Another great design from Eternal Maker's in-house pattern brand, Two Stitches. Easy to make jersey A-line t shape with extra back detail.Can be adapted to woven fabrics. 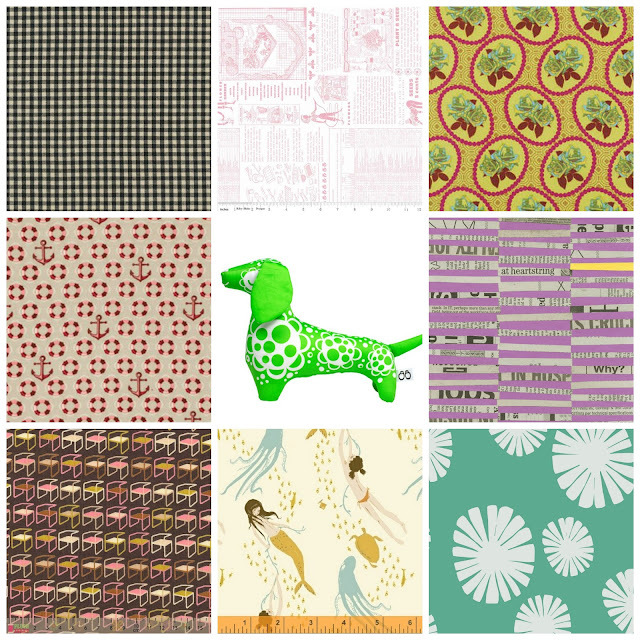 Also available as a paper pattern. Petrol solid double gauze by Kobayashi, Japanese import. 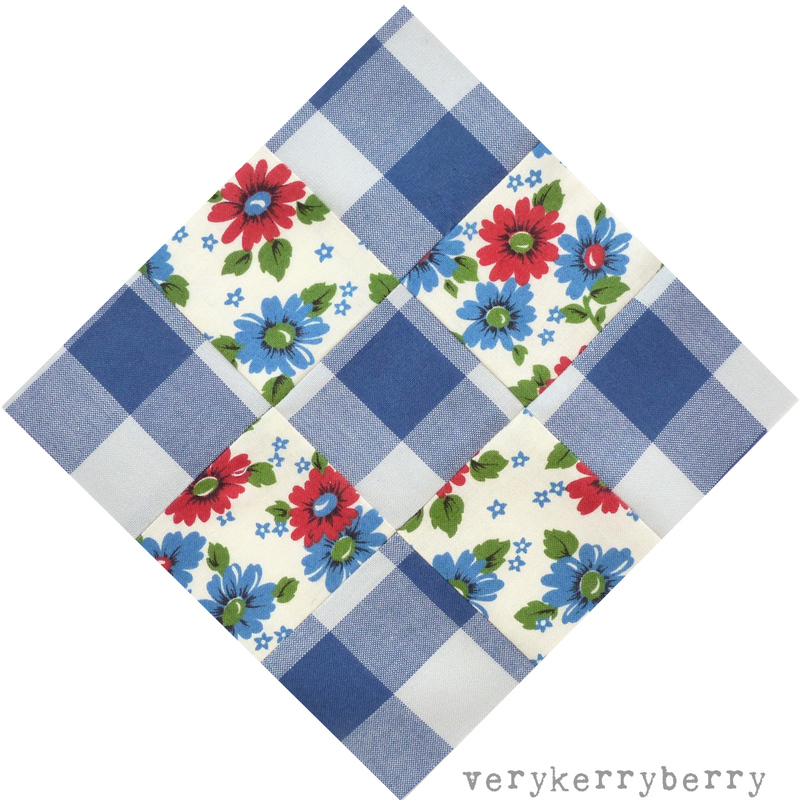 Beautiful for dressmaking and a great mid blue colour. The keen dressmakers amongst you may have seen the new pattern from Deer and Doe. The Safran is a high waisted skinny jean suitable for stretch fabrics like twill and denim. Camille, the development manager for D and D got in touch and asked if I'd like to review the pattern- it had already been through detailed testing. I'll confess, I don't usually wear jeans but I knew they would be very much my daughter's style so I leapt at the chance. I knew I need to make a test version so when I went fabric shopping I bought 2 metres of 140cm stretch denim which was enough to make shorts and full length Safran jeans. The right fabric is key to this pattern. The fit is based on negative ease so the hips for example will be smaller than your actual hips. Camille sent me extra info about the degree of stretch- 20-30% is the optimum. This is tricky info to find out online, I feel most online shops have some way to go with the detail on their stretch fabrics- i.e. degree of stretch, direction, weight and detailed suitability rather than skirts, trousers, bags, dresses which feels too broad. I found this locally, it was the only blue available and it's a blue black. It's a medium weight and 25% crossways stretch. This means that if i hold a 10" width of it between my hands, I can stretch it to 12.5" relatively easily and it will bounce back to 10" when released. I take a quilt ruler to fabric shops when buying fabric like this. To help with the stretchiness of the fabric, I used a walking foot throughout for seams and topstitching and I also used three machines: one for seams, another for topstitching and an overlocker for finishing seams. It's an intermediate pattern and definitely needs some sewing experience but the details are achievable and accuracy is the key. I use my old Bernina for topstitching and buttonholes as I find my stiching is a lot straighter with that. I used my Janome for seams because it had triple stretch stitch (used on the crotch and back seam) and I can lower the foot pressure to deal with the bulk. 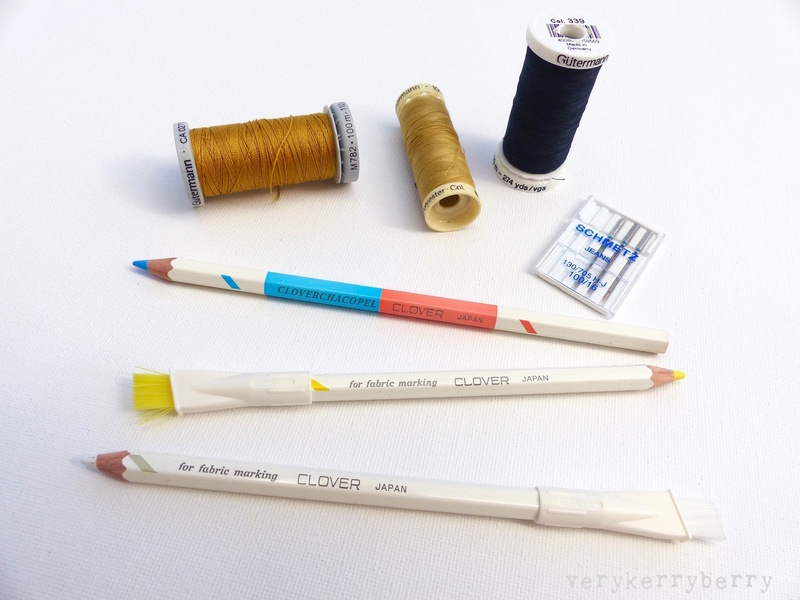 I also found my Clover chalk pencils invaluable for mark making e.g. pocket placement and top stitching. Based on L's 25.25" waist and 37" hips and from the Deer and Doe measurements, I traced size 36 (UK size 8) waist, grading to size 38 (UK size 10) at the high hip and below. On the front piece you can't really grade on the seam which forms centre front and the fly so I traced a size 36 there as L is very flat over the belly and 38 elsewhere. 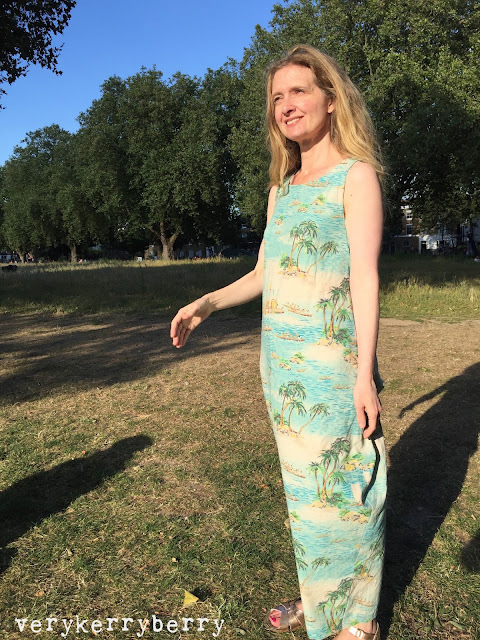 On the first fitting, she needed more room at the side so I added a further ¼" at the widest parts adding 1" to the hip all round which on the front meant adjusting the pocket and all the corresponding pocket facings and linings to add width to match the back piece . The high waist fitted without adjustment. To get the shorts length, I used a pair of her favourites and added an extra inch to the length to allow for the hem when tracing the pattern. You could flare the short legs out at this point if you wanted. I omitted belt loops; L usually has to wear a belt with jeans as to get the hip size she needs, the waist is usually too big so with these I was aiming for a perfect fit at the waist. I repositioned the buttonhole slightly closer to the waist band side edge. On the pattern instructions there is a detailed fit section with lots of diagrams describing common issues and how to solve them. With all the fitting adjustments for the hips sorted I made her a full length pair. I did need to fit the lower leg a little as the knees and calves were a little baggy. The back leg is cut wider than the front especially in the lower part. This works well if you have sizeable calves- I do and I tried these on and the calf area was fine for me- for my daughter's skinnier calves I reduced the back legs by ¼" on each seam from 3 .5" above the lengthen and shorten line to the hem. The front leg was not altered. Practice on scrap fabric and make a note of your favourite top stitch length settings so you can repeat where needed to finish your jeans and make them look professional. I got the best top stitching tension using thick top stitch thread for the right side and standard sew all thread for the bobbin. Weave in your topstitch threads. Leave your thread ends long and then use a needle and weave these into seams on the wrong side by hand to avoid bits sticking out on the right side. I didn't finish the back pockets. Instead I trimmed with pinking shears after the first top stitching. They are secured with two rows of stitching so I thought that was enough. I used a pair of ready-to-wear jeans for some of my seam top stitching and kept it fairly minimal. Stay stitch the waist edge pieces ¼" from the edge. Denim frays easily and when it comes to fitting, pulling stretch jeans off and on before the waistband is added can be a bit of a strain, stay stitching helps keep everything from stretching out of shape. Trim and grade seams when adding the waistband. 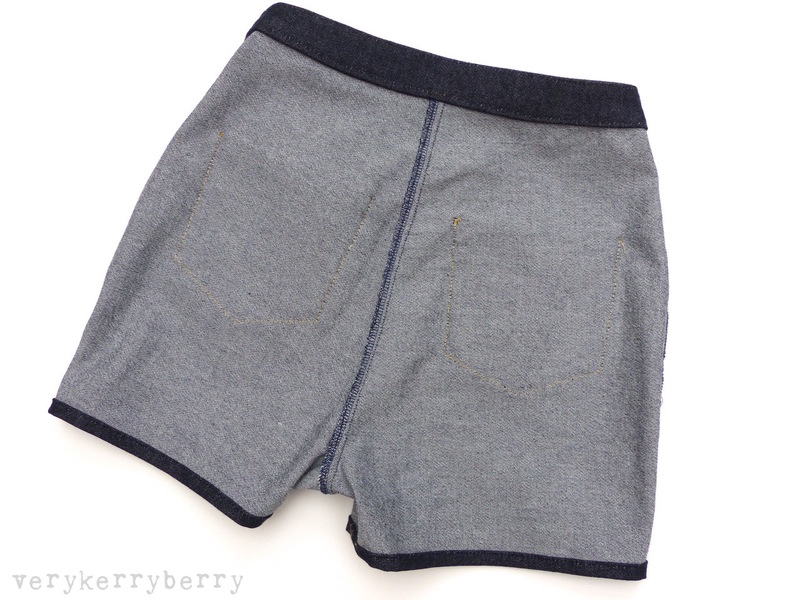 The inner waistband part of the seam is cut smaller than the outer to reduce bulk and lie flat. Practice on scrap fabric and make a note of your machine settings for a bar stitch so you can repeat it where needed. I used it were the pattern suggests for the fly but also for the side seams where the pockets start. For the buttonhole, most ready-to-wear jeans have a keyhole buttonhole to allow for the thick shank of a metal button and take the wear and tear of opening and closing. I don't have that setting on my Bernina so I sewed a standard buttonhole, applies fray stop before cutting the hole itself. I then resewed the buttonhole manually stitching around one end to create the curve. Fiddly but worth it. I was thrilled with both versions of Safran. The shape really suits L and the fit is wonderful. Although I needed to fit them to her shape, it wasn't particularly hard to do so. The pattern instructions are comparable to other Deer and Doe patterns. They are to the point and accompanied by diagrams which inform the text. They are not hand-holding and at times I was finding my way a little, the fly always confuses me a little despite having made them many times for the Fumeterre skirt. I ended up with my crotch seam lying the wrong way in the shorts version and I found the second pair easier and everything is correct. L is happy with these new additions to her wardrobe and at having jeans that fit exactly to her shape and I enjoyed the challenge of making jeans having not sewn any before. I've made a lot of Deer and Doe patterns and they always deliver a lovely garment. Thanks Camille for sending me the Safran pattern and asking me to review, it was a pleasure! I've ben spending most of the summer enjoying my daughter being at home. High school has ended. results are imminent and college is coming in September. Meanwhile, I've been making more Kielo dresses including a shortened version for my daughter's 16th birthday. 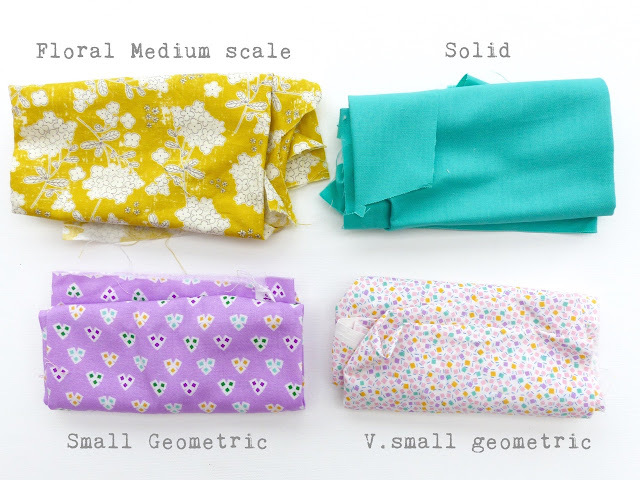 The fabric is a another drapey floral kindly sent by Mark at Girl Charlee. He was kind enough to send me samples first to make sure the drape was right for this style. She chose Red Pink Roses on black cotton jersey blend which is lightweight with lovely drape. I shortened by working upwards from the hem on the pattern and using a jersey dress in L's wardrobe that was a favourite length. I traced a copy off my size 36/UK 8 pattern for L. She tried on my jersey Kielo and she needed a narrower lower back and waist so I reduced these areas along the back centre seam. The front is unchanged apart from being shorter. These are all florals as that was her preference but there's other options and Mark and the team are happy to advise, they know their stock well! 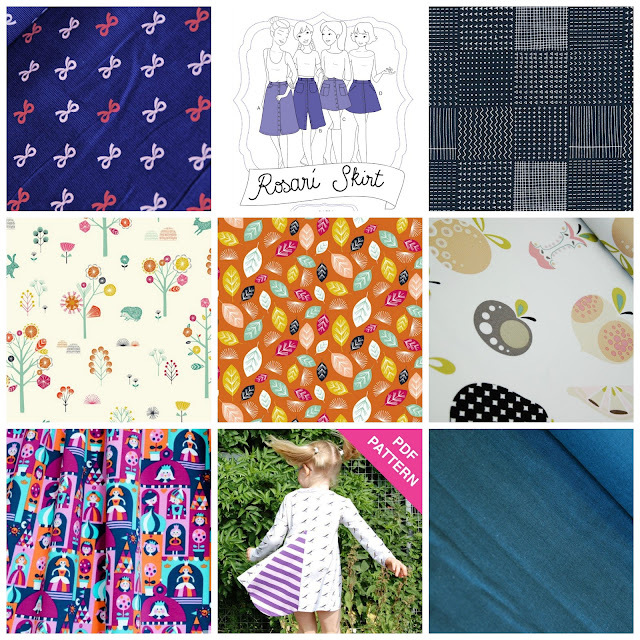 Mark has kindly offered the sort of giveaway prize that I would love to win, a PDF pattern (lots to chose from including Wendy Ward, Named Clothing, Itch to Stitch and many more) and knitted fabric of your choice to make the pattern from Girl Charlee Fabrics UK and Europe. As the company name suggest, entries are open to UK and Europe. To enter, comment below and tell me what you would choose- it's not binding, you can change your mind if you win, I'm just curious! For extra entries, share this giveaway on Twitter, or Facebook and add an extra comment for each mentioning where you shared. That's it, nice and simple. Competition closes Monday 7am GMT. I must be able to contact you so check if you are no-reply and include email details if needed. Good luck! Giveaway is now finished. A winner has been randomly chosen- number 25, Mel- and informed. Comments are closed. 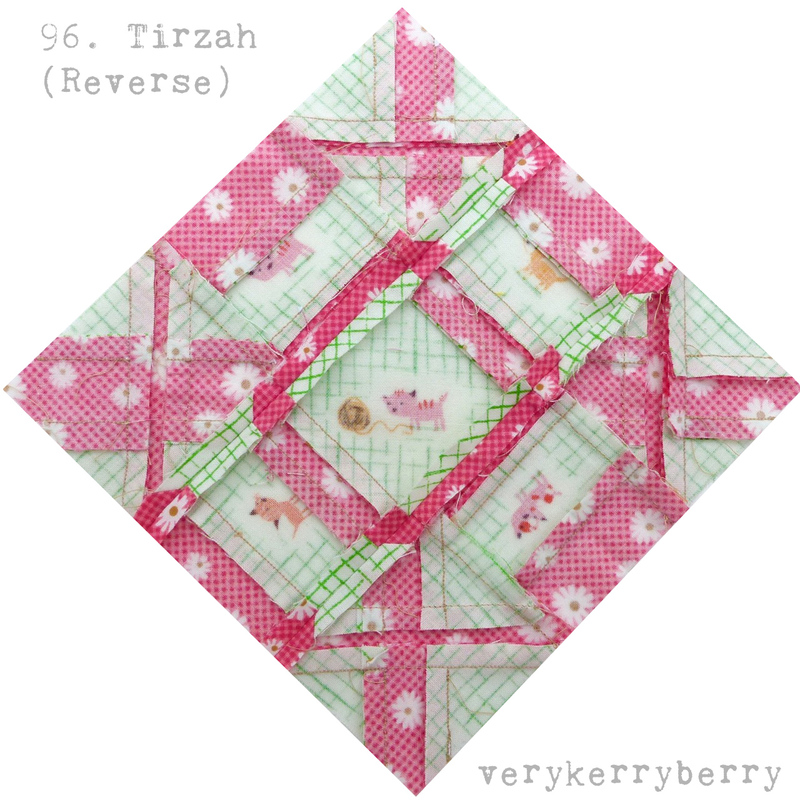 Tirzah, Block 96 ( p. 255, letter p.86) looked a little tight or dense from the block photo in the book so I used a pattern rather than a solid colour to break it up a little and added a bit of fussy cutting so it now looks like cats in various playpens. I didn't know Tirzah as a name so I looked it up and Wiki informed me it is a Hebrew word and meaning, "she is my delight". The letter is worth a read. It starts with a familiar description of a less than immaculate house but the reason for a little untidiness goes beyond a desire to sew or even help on the farm. It's a touching read and a timeless message to enjoy home and family above all else. Jo from A Life in Lists returns for the last guest blogger post next Monday. August at Plush Addict: Sale time, ends Midnight today! Good timing as I put nine choices together for my sponsor post for Plush Addict this month- there's a sale that ends Midnight today, quick quick! Robert Kaufman yarn dyed ⅛" gingham squares in pepper. Beautiful cotton gingham- woven check not printed. Also available in brown in this size and a little smaller 1/16" size. Lori Holt for Riley Blake, Flower Patch text print. Lovely low volume print, I have this in my stash and it's one of my favourite text backgrounds to combine with bright floral prints. Anna Maria Horner for Free spirit, Hand Drawn Garden Coral Waltz. Tula Pink for Free Spirit, Floaties and Sinkies. Papa Kit Make Your Own Dog in Green. Unbelievable reduction from £19 to £5. Other kits available including fawn and owls. Carrie Bloomston for Windham, Paint Staggered Stripe. 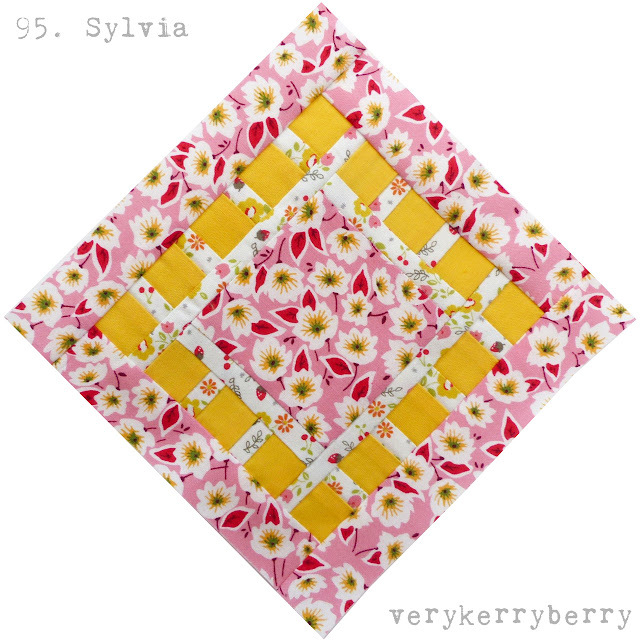 Described as hot pink but in reality a violet purple and a great quilting print. 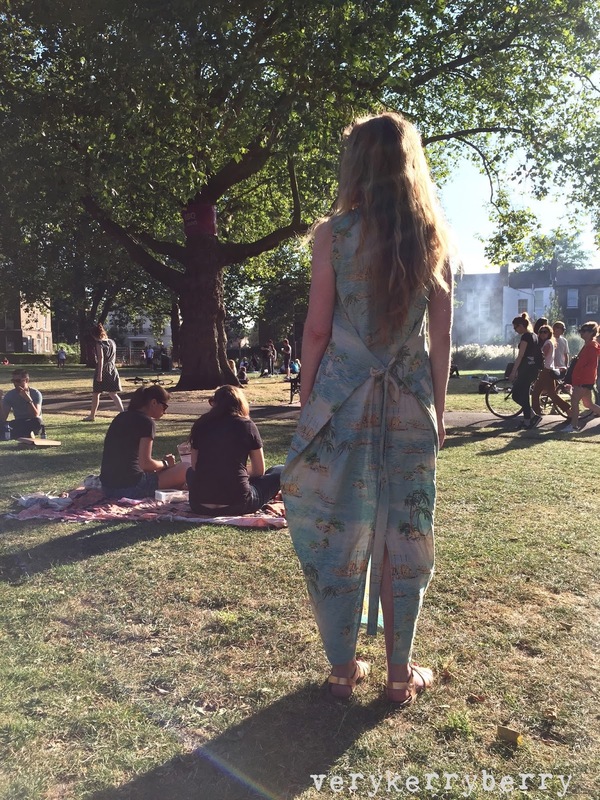 Tana Lawn, Chairs- an absolute bargain for dressmaking! Heather Ross for Windham, Swimming with Sea Creatures in cream/blue ( also available in pink), there's lots of other Mendocino in the sale too. Lotta Jansdotter for Windham, Follie canvas. Great for cushions, bags, purses. Shop the rest of the sale here whilst you still can. 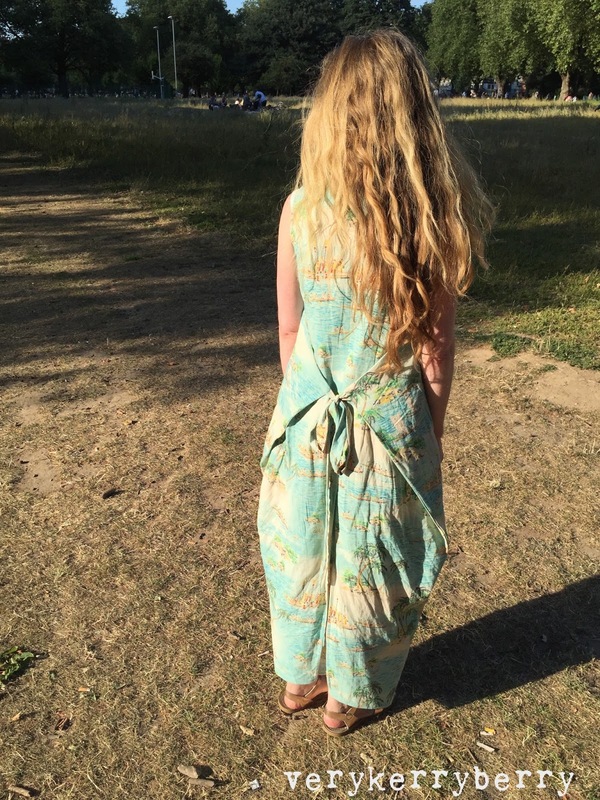 Kielo wrap dresses have been my go-to garment for the summer. I've made three for myself and one for my daughter. I've also had more requests to make these for other people than any other clothing item I've made. I've made one for my daughter- next on the blog post list, but I don't tend to sew commissions, it's a minefield of pricing and fitting. Each Kielo I've made has been from a different fabric. The first was a rayon blend jersey, the second was woven rayon and now this version is sewn in linen. Purported to be Ralph Lauren by the seller at Preston market last year, it is a beautiful quality fabric. It's been sitting waiting for a pattern that will make the most of it's picture print and although cutting out a Kielo dress on a single direction fabric is a little wasteful, it was worth it. This one definitely looks better loose and with the ties at the back. The print design is better displayed and the informality suits hot days. It's still fitted at the shoulders and the rest of the dress flows as I walk When tied to the front, it looks a little bulky and origami like- almost Kimono style. I made it in the same way as the woven rayon version, including the jersey binding. 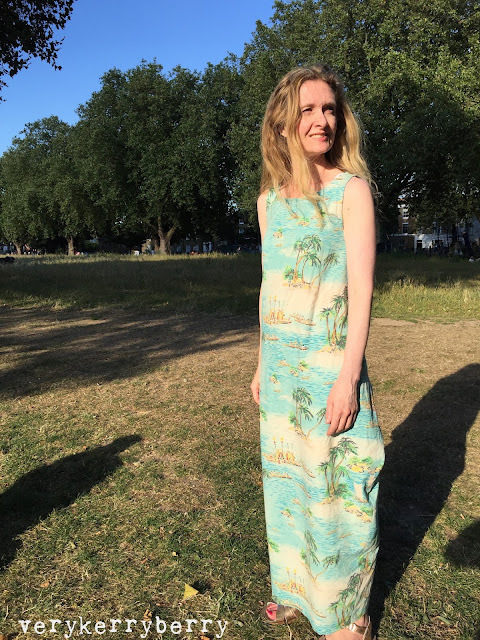 I was in London last weekend visiting my brother and I took three Kielo's as my wardrobe for the warm weather. I was even stopped in the street by a stranger wearing this Kielo and I undid the ties to show her how it worked! Thanks to my bro for taking the pics. 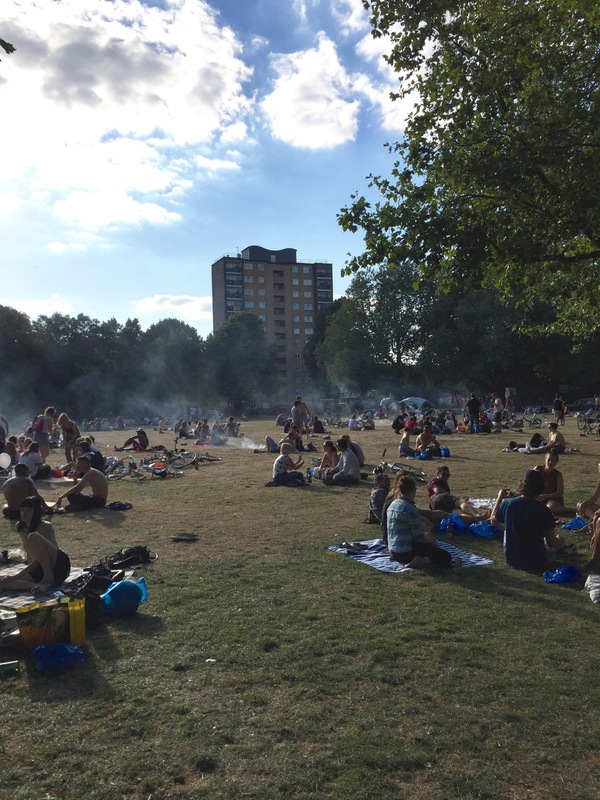 This followed a lovely afternoon spent at St Pauls cathedral followed by a walk by the canal and a walk through London Fields, a beautiful park in Hackney filled with people barbecuing, playing games and enjoying the weather. Happy days, the peak of late summer, good times. Moving ever closer to the end goal of 99 blocks in the Farmer's Wife 1930s QAL. and here are blocks 93 and 94. Starlight, (p.252, letter p.72) is a straightforward block to foundation piece. I rotary cut the squares, half-square triangles and rectangles for the large green triangles using the dimensions below. For the outer shapes, I used freezer paper templates to pre-cut the shapes before foundation paper piecing - see here and here for the technique. These are for foundation piecing so are cut larger than needed. 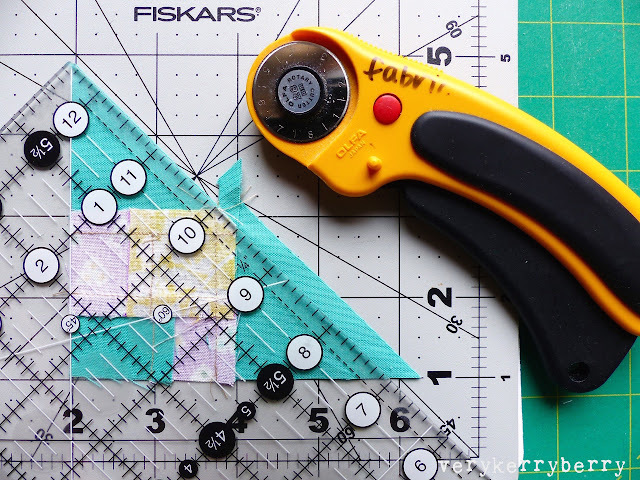 Quantities given are for foundation piecing the whole block but you can try the nine patch and strip piecing method above for some parts of the sections. Block 94, Susannah, (p.253, letter p110) is a delight to piece. It can be foundation pieced or rotary cut- I chose the latter technique for this one. This block is so dynamic on point, I really like it! 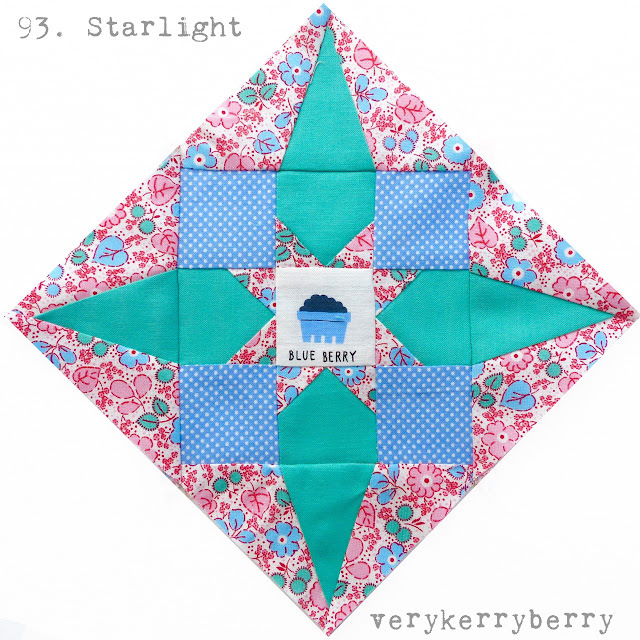 Fiona from Poppy Makes is guest posting with thoughts on this block and the quilt along, click here to visit. I have a further new nine-patch blocks for my collection.